Have you ever heard of Forrest Fenn? He apparently is or was a multi-millionaire art dealer, author, and Vietnam War veteran who in 2010 decided to encourage people to get up off their couches, leave their video games and televisions behind and get into the great outdoors. He did that by taking a bronze treasure chest, filled with gold and jewels, up into the Rocky Mountains somewhere and leaving it for some adventurous treasure seeker to find. The treasure is estimated to be worth around $2 million. He wrote a book that includes a poem with 9 clues to help you start your hunt and has followed that up with a few more clues over the years, as the treasure has remained hidden. As far as I could find, the treasure has not yet been found, so it could still be out there, waiting for you. Does anyone want to go treasure seeking? I will say I am interested in some ways, not so much because of the money, but because of the adventure of it. 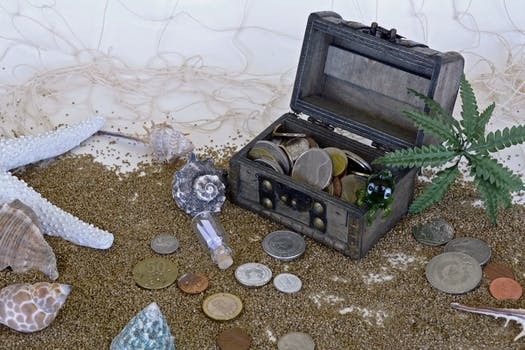 It sounds like fun, but in the passage we are going to look at today, we are going to talk about treasure seeking, but from a heavenly perspective. Now, in Jesus’ time some of the things that were valuable may not seem as valuable to us today. But while the items that were considered valuable might have changed, we can still understand the concept of earthly treasure. Jesus gives a very practical reason for not laying up earthly treasures for ourselves. They rust, get moth eaten or stolen. These would have been very real threats to the material possessions of the people in Jesus’ time. Those are just natural things that can happen to our things. There are other natural things like bread becoming moldy, or a house getting broken down by a storm, or a fire destroying crops. Not only are there natural threats to our material possessions there are other threats as well. Jesus mentions thieves who would break in and steal, and today we might also think of other factors like market crashes, bank failures, or other outside influences. There are tons of things that can go wrong with our stuff. Even if we live our whole lives and don’t lose our wealth or possessions, we can’t take them with us when we die. They are temporal. Jesus then contrasts earthly treasures with heavenly treasure in verse 20. As Christians we have been declared righteous, have been redeemed from slavery to sin and death, have our names written in the lamb’s book of life, have been given the Holy Spirit, have had our sins forgiven, have been shown grace and mercy, and can look forward to the day when we will spend eternity with God in Heaven, just to name a few. Moths and rust cannot touch these blessings. While earthly treasure is temporal, Heavenly Treasure is eternal. So purely from a dividends perspective, heavenly treasures are better to invest in, because they last forever, while earthly treasure does not. But not only does it not last, it isn’t as valuable. Even if we could take it with us, imagine waking up in heaven and having a suitcase full of gold bars and diamonds. What good is that, in Heaven, they use gold just to pave the streets. It would be like carrying around a suitcase full of asphalt. And who would not trade all the money they have to have a life filled with no more crying, no more pain, no more grief, no more sin, no more death. It’s no contest. Even just looking at this from an investment perspective, kingdom treasure is way better than earthly treasure. I think there is a very important concept here that we need to grasp. Earthly treasures are temporal, because life here on earth is temporal. This is a foundational point that underlies the overall perspective of this passage. If we don’t look at life here on earth as if it is temporal and fleeting and that our eternal home is in Heaven, then this principle of laying up for ourselves heavenly treasures rather than earthly ones doesn’t make sense to us. Compared to what is in store for us, life on this earth is but a drop in the bucket and we can’t miss that bigger picture. So Jesus is not really addressing whether or not you can be wealthy and still be a Christian, he is talking about our heart focus. Let me ask you, what is a treasure? Something valuable? What makes it valuable? It may have an actual value like gold or jewels, or it could be valuable simply because it is meaningful to us. Like we might treasure old photographs or some thing that meant a lot to us when we were a child even though it may not have much monetary value. So the idea of treasure has to do with the value we place on it. Our heart is invested in what we treasure. To some extent, treasure to us is whatever we treasure. Which makes sense according to this verse. Whatever we think of as precious to us, becomes our focus. In the Lord of the Rings movies and books there is this ring that is kind of the focus of the movie and there is one character named Gollum or Smiegel, who refers to the ring with a particular phrase. He calls the ring: “my precious.” The ring for him is more important than anything else in the world. It is precious to him. It is what his heart treasures most. So I want to ask you a rhetorical question for you to ponder during the rest of this sermon. The question is: what does your heart treasure most? Just keep that in mind and let it percolate in the back of your head as we look at the rest of the chapter. The eye is the lamp. It illuminates the darkness. It lights the way for us to see in a dark place. It is through the eyes that we see the path before us, the obstacles in the way, the signs that point the way, things like that. Have you ever been walking down a path and your attention is not on where you are walking and you trip and fall? If our eyes are not focused on where they should be, then we are going to be more likely to trip up, or maybe go the wrong way. Let’s consider this then spiritually. The word translated here as healthy also can be translated as single our sound. Like meaning a singleness of purpose. With regard to the eye it suggests clear vision. With clear vision and singleness of purpose, we can move in the right direction, but if we do not have that singleness of purpose, if we have a divided heart or unclear vision, maybe even double vision, we are going to be stumbling around, making bad decisions. If we become too focused on earthly treasure rather than heavenly treasure, our vision gets blurred and we start running after the wrong things. The word “master” suggestions something like a slave owner. The word in this verse for serve comes from the word that means slave or bondservant. And a slave does what the master wants him to do. So if you are a slave to two different masters it makes sense that sometimes their interests are going to conflict and you will be put in an untenable position. It is not possible for us to serve God and money. Think about it. The Bible says that “the love of money is a root of all kinds of evils” so God’s purposes are going to clash with a love of money. And when that happens, our loyalty is divided. We can’t serve both masters. We have to choose. So once again the question is, what do our hearts treasure most? That is kind of a tough question to answer, so what are some good ways to figure out what we treasure most? Maybe looking at where we invest our time? Maybe considering what we tend to think about? How about considering our priorities in the midst of decision making? Those would be some very telling questions for us as we consider what our heart treasures most. Now let me warn you, I am going to say something maybe a little bit hard to hear or controversial right now, but I think it is important for us to really dig into our lives. This is just a little example for us. Think for a moment about how likely we are to go into work early or stay late or take work home in order to maybe move toward getting a raise, or maybe we take on a second job to earn more money because we are not making enough in our regular job, or maybe we go back to school so that we can earn an advanced degree so that it will look better on our resume. All of those things are fine. No problem with working hard and earning money. Please don’t misunderstand me. But I am just trying to get into our mindset a little bit. Okay? So that is fine right? But now let me ask how hard is it sometimes for us to find the time to set aside for devotions or prayer or going to church or helping someone in need or ministering to our neighbor? Good question right? Those are the kind of tough questions we need to ask ourselves as we consider what our hearts treasure most. We have a lot less problem finding time or making time for things that are going to help us get more earthly treasure, but seem to struggle with finding time to spend with God. I think that is a good question for us to ponder. And it is not easy, because if we are really honest with ourselves we might not like the answers we come up with. I think that if we are truly being honest with ourselves then this becomes a very challenging passage. But think about what Jesus is saying overall. In verse 19 where it says do not lay up for yourselves treasures on earth, could be translated as “stop laying up for yourselves treasures on earth.” I would not necessarily change the translation, but the word stop kind of suggests the recognition that our default pattern is to lay up for ourselves treasures here on earth. It’s kind of just what we naturally do. We worry about meeting our own needs. We are concerned with caring for ourselves and making sure that we have enough. Not only for today, but for tomorrow. We are constantly being reminded to look ahead to our retirement years and making sure now that we will have enough for then. But remember, just two short passages ago, Jesus was teaching us to pray, “give us this day our daily bread.” That kind of prayer just doesn’t fit with laying up for ourselves treasures on earth. He wants us focused on trusting and following Him. There is this common theme running through the Sermon on the Mount of no longer trusting in ourselves, no longer relying on ourselves, but surrendering each day and every tomorrow to God and letting him be the one in control. And that is not easy. But that is what kingdom living looks like. For now I want to point out that if we truly treasure God above everything else, then our earthly treasure, goes onto the altar of sacrifice for God to control as he sees fit. That means that rather than being focused on our wealth and trying to keep it or make more, we are focused on God and letting him control and direct everything we have. Our wealth, our possessions, even our very lives are to be fully devoted to God. Our hearts need to treasure him above all else.